When measuring your cushion for replacement, remember that your old foam and cushion cover may have changed size and shape over time. 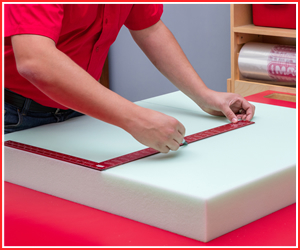 Often old foam becomes compressed or misshapen, so it’s important to measure both the foam and the cover and compare those measurements. If a discrepancy exists, we suggest you follow the size of the cover, being sure to measure the cover seam to seam while the fabric is pulled tight. Key project tip: When measuring the thickness of your cushion, be sure to compare the overall thickness against the band thickness (the band thickness is the seam to seam measurement on the side of the cushion cover). If there is a difference, be sure to include this in your measurements. In cases where you no longer have the original cushions, or you’re starting from scratch, you can measure the overall space to be covered by the cushions instead of measuring an existing cushion. Measure the width and length of the desired space and then choose a thickness that fits the comfort and look you’re hoping to achieve. Key project tip: Keep in mind that foam can be over cut in any direction by up to a 1/2inch in order to achieve a tighter final look inside the upholstery. In situations where the space you’re covering is an irregular shape, a good top-down drawing can be very useful. Following the same instructions as above, measure and label each dimension on your irregular shape. 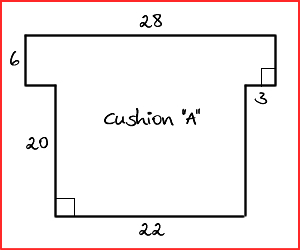 Noting which corners are proper 90-degree corners is very important on most irregular shaped cushions, whereas other angle measurements are not required in most cases. Be sure to include thickness measurements with your drawing. If you’re ordering multiple cushions that are to be specifically arranged together, be sure to include a top-down drawing of how the cushions will be arranged. It is also often helpful to label them with a unique number or letter to keep them organized during the project. Ok I’m ready, what now? To find The Foam Shop closest to you, where you can place your order, check out our locations page!